XP924 was originally an FAW.2 and served with 899 NAS before being retired from frontline service and converted to a D.3. Flown out of Llanbedr for many years, on retirement from her drone duties in 1991 she was acquired by Gwyn Jones and much effort was put in by him and Marcus Edwards (an ex-RN Sea Vixen pilot) to get her back in the air. Ferried in May 2000 from Swansea to its new base at Bournemouth International Airport, De Havilland Aviation succeeded in getting a Permit to Fly for the aircraft, and operated her on the airshow circuit on behalf of her owners, Drilling Systems Ltd. Her first two seasons were blighted with poor weather and unserviceability earning her the unkind 'No-see Vixen' description, but in early 2003 she gained sponsorship from a drinks company and was repainted to match a can of Red Bull. She then flew for three full seasons on the airshow circuit with much improved luck, until the sponsorship deal came to an end in 2007. Returned to her 899 NAS colours, she lay dormant until June 2008 when a new insurance deal enabled DHA to return her to the air. She carried out a handful of airshow appearances from July onwards and was also on the circuit for 2009, with additional funding courtesy of the Royal Navy - as many of the RN Historic Flight's own aircraft were grounded by various gremlins. She was flown in 2009 by Lt Cdr Matt Whitfield RN, a former Sea Harrier and current Hawk pilot (who has also flown the RNHF's Sea Hawk) but Matt suffered a stroke in August of that year (thankfully he has since recovered, certainly enough to be back flying Hawks) and De Havilland Aviation also went bankrupt a little over a month later. This left the aircraft without a pilot or engineering support for some time and despite best efforts she sat out the 2010 season on the ground. 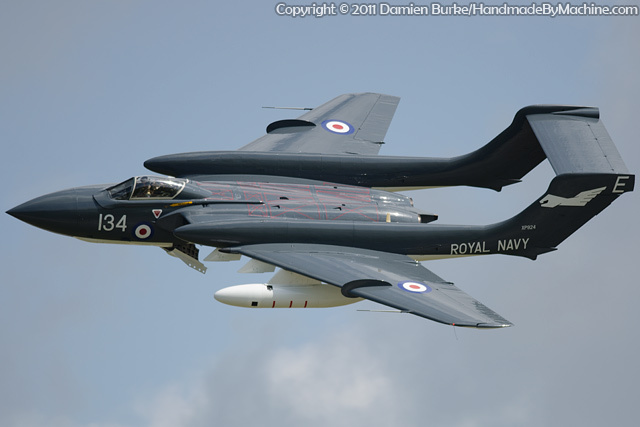 Engine and fast taxi runs have kept her active and with Simon Hargreaves (an ex 800 NAS Sea Harrier pilot) trained up to fly her, she rejoined the airshow circuit at the 2011 Yeovilton Air Day. Happily bookings were pretty healthy and she became a regular favourite at various shows, and in 2014 she was gifted by then-owners Drilling Systems to the Fly Navy Heritage Trust. She moved from Hurn to Yeovilton as a result. Unfortunately during a display in 2016 some damage was caused to one of her flaps; the repair was a big job which kept her grounded until early 2017. She then performed a single display at Duxford in May before experiencing a hydraulic failure on her return to Yeovilton, resulting in a gear-up landing which has caused significant damage which is likely to ground her for several years - assuming she can be repaired at all. See the Navy Wings page on Facebook for an update.